Finally, an update on running, racing, hills and bikes! It has been a long time since I last wrote. Honestly, I just didn’t have the time to get a post out. Life has been rolling at a thousand miles per hour for the last month, but I did get to run a race, run most days, do a huge hill run and bike some trails. This was the 3rd time TJ and I ran this race for the Ronald McDonald House. It was a great race for us. RS joined this year for his first year running this 5K and a coworker of TJ came also. TJ came is second overall out of 340 runners of the 5K. Wow! I came in 2nd in my age group (the old guys) and 19th overall. RS ran his first race in 6 months and beat his last time by 10 minutes. He has just started taking up the running mantle again. TJ’s coworker ran his first 5K. TJ has been running with him once a week and the guy went from out of shape, to running his first 5K, first 3 mile run and best time he had ever run. TJ was so excited to have such an impact. It was 18 degrees and windy at race time. Okay, that wasn’t cool… it was cold. I couldn’t feel my fingers in my gloves by the time I finished. Alabama isn’t supposed to be that cold, EVER. It was a good race and as always the Ronald McDonald House did a great job and raised a decent amount of money. We joined the race too late to do any fund raising, however it was a great event to be a part. My running is picking up a bit. In December I hurt my heel (heel spur to be exact) and had to slow down. It still hurts from time to time, but I can and do run each day. I am trying my best to get out of running 4 miles. I have been stuck in a rut since summer and need to get some distance. Last week I ran a 5 mile and 6 mile run, so that is a beginning. Running in the cold isn’t my favorite thing to do, but it is better than the heat. The last few days it has been between 60 – 70, so life has been quite good for running. I told TJ over the weekend that I really needed a hill run. I haven’t run hills in a long time and I could tell. My legs have felt tired during my daily runs and my hip/back hurt much more over the weekend after I picked up my mileage last week. He asked if I wanted to run the hills in a nearby neighborhood and I agreed. It was insane. We ran a total of 8 miles (my longest run in a long time) and 700 feet in elevation. He stayed with me though and I made it through without stopping. The day before RS and I road bikes on trails at our state park for an hour and my legs were already tired. So the hill run wiped them out. Toward the end of the run we ran the biggest hill around. I almost didn’t have the strength to make it. My breathing was labored, but my legs had nothing left. I plowed through and made it to the top of that hill, but I’m sure I wasn’t moving very fast. The last quarter mile I put everything into the run I had left. I can honestly say I have never felt so tired since my marathon. The good news is that my legs feel better today. Yesterday, the day after the hills, my legs still felt off. My 4 mile slow recovery run was very slow and not fun. Today, after a good night sleep and some time between me and the hills, my legs feel better, my back is better and my hip doesn’t hurt. I don’t like running hills,, but they are worth the pain, at least for me! Life is beginning to return to normal. My work has been insane (14 hour days at times) and as a result, life was stressful. Work is still hectic, but I feel like I am beginning to get a handle on things. I hope to possibly run the Shamrock Half Marathon in March (was trying for the marathon, but… NOT). If I can stay healthy and increase my mileage, I should be label to do it. PS – My weight got up there after the holidays and injuries. I was near 200 lbs January 5th. Today (Jan 21) I am back to 188. I hope to continue this downward trend in my weight for about another 10 lbs. Retro Run 5K – Finishing the race! I was only a step behind the couple that was running in front of me the whole race. There was only 1/2 mile left in my 5K. I know my time wasn’t going to be a PR, but I felt like I was running solid. Actually I was quite happy as I hadn’t done any workouts or mountain runs in a while. Just my 4 mile daily runs. I had a thought. I could push past them (that couple), but then I thought, “what if I run out of steam and they pass me – that wouldn’t be fun”. We were running at a good pace and so I decided to hold back until later, right before the finish. It was hot. The race started at 7:00 PM in the South on a sunny July day. My app read 94 degrees at the start. As I pondered my finish to the first 5K I had run in 7 months, I thought back to the beginning of the race. I was only about a half mile into the race and I had doubts. I thought to myself that I couldn’t do this racing anymore. I should just stick to my daily runs and be done. What am I doing running a 5K when I hadn’t even run my mountain in over a month. Nope. Racing is not for me. This will be my last. The couple ahead of me were a woman and a man. Both about half my age. The woman was obviously in great shape and the guy was not. He wasn’t overweight, but he was hurting. This was probably his first 5K. As we got closer to the finish, suddenly he stopped. The woman looked around and begged him to keep going. We were about 1/4 mile from the finish. He had nothing left. I moved on, but felt badly for the guy. He had run a good race, but didn’t have enough in him with the heat. As I rounded the last block, I passed another guy who was half my age. He looked at me and told me to go for it. That was so nice. I said the same to him and he thanked me. I pushed to the finish. The line was directly in front of me. My mountain legs had kicked in. The last mile of this 5K was uphill most of the way. Running a mountain once a week has allowed my legs to have strength to go uphill. In fact, many times my pace goes up while going uphill. This was the first finish of a 5K where I had strength to really push it at the end. I gave all I had. My Lovely Wife and daughter rooting me onward, I passed the finish in 22:32; 45 seconds slower then a PR, but very satisfying. Before the race, TJ asked me how confident I felt. I told him I had no confidence. I was just going to go out and do the best I could. I came in 2nd in my age group (the old guy age group). I was thrilled as I had never placed in this race before and this was the 3rd time we ran it. There were over 400 people and I came in 41st overall. I don’t know what happened with that couple. I never saw them after the guy stopped. I was so hot and tired at the end, I really couldn’t think much. I hope he pulled it together and finished the race. Life is like a 5K. So many times we either don’t want to be in the race or we want to stop right before the finish. Ultimately the joy of the finish erases all the pain of the race. My hope is that everyone could run as to finish the race. Life is too short to give up in the middle. I’m not sure why I wrote that last paragraph, but I hope it helps someone. Have an awesome week and keep your eyes on the finish! For those of you who may not have read, I have issues with my hip/bursitis/SI Joint. Needless to say, on a good day it can be hard to run and on a bad day… I walk. Yesterday was a rainy day which usually will make my bursitis act up. It was cool out, in the low 50’s. I wasn’t looking forward to running in cool rain. I did anyway. On top of everything else, I had just run a 5K on Saturday. After my last 5K I had to take a month off because of my hip. So I went out yesterday and got through the first mile and realized I didn’t hurt. By the second mile I may have had a moment of discomfort. Third mile… Nothing. Forth mile I was worried when I felt a twinge, but still nothing. This is the first run since my marathon on September 8th that I had no pain and it was also after a 5K that I ran at a 7:50 pace. So I am excited. I hope I am moving on and can actually start training again. It may be too late for the Mercedes half marathon in February (which was my favorite race of all last year), but TJ and I will look around and come up with another one. I would like to beat my half PR of 1:44. That will take some training. Just to be clear. I know I need to be careful with my hip. I imagine another week or two of running my 4 mile route will get me where I want to be. Also as of yesterday, I am 1 mile behind my total mileage of December. Now if I can lose that extra 10 lbs, I’ll be ready for anything! It really was a good race. There was a 5K that I ran and a 10 miler (that was almost cancelled). As I mentioned Saturday, we had storms and flooding all night. 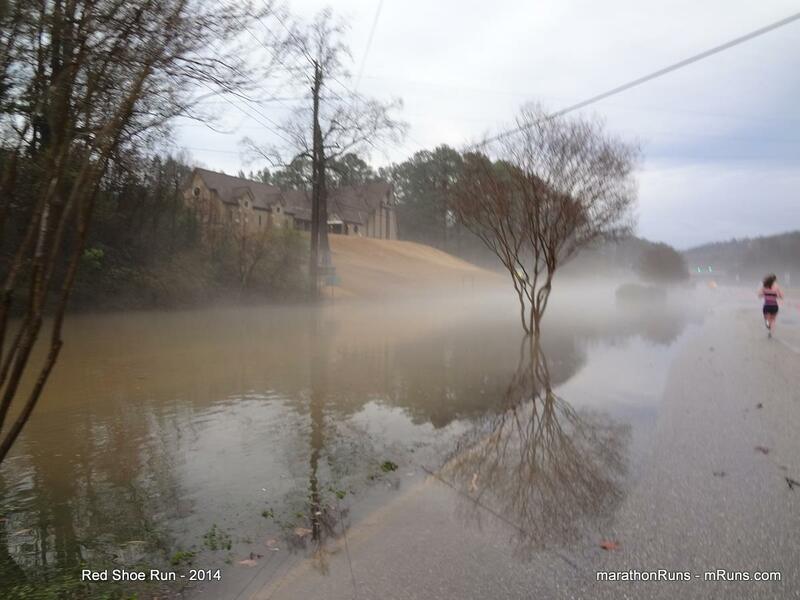 Right before the race, a water main broke on the 10 mile course. I joked with the guy who I was asking about it that they could turn it into a biathlon. Okay, why was my race a good race? I ran the way I wanted. I knew I didn’t want to hurt my hip, but I did want to do as well as I could. So I went at it with 2 goals in mind. The first was that I wanted to keep at least an 8:00 pace. This is my half marathon pace and I felt that I could do that and not get hurt. The second was that I wanted to run to feel. I didn’t want to push so hard that I felt like I was dying, but I did want to do well. I accomplished both goals. I ended at a 7:50 pace and I only felt winded twice. Once was when I had to run hard to get past a 7 year old boy. 🙂 This was about a half mile into the race. Every time I started to catch him, he would speed up. In the beginning I was impressed, but after a while he really kept getting in my way. So I ran hard around him and moved on. Actually at the 2.5 mile point, my hip started hurting me and I just made myself relax. I have found if I consciously tell my self to relax, it usually gets better and it did. The last time I pushed to hard was at the very end. I had just passed a 28 year old on the last hill. He didn’t like that very much. As I rounded the corner to go to the finish, he went flying past me. Not to be outdone by a young wiper snapper, I ran as hard as I could to catch up. I got close and then… my hip… stupid… what was I doing! I was running at a 6:00 pace in a race that I was so careful in not to get hurt. So I pulled back, let him beat me and feel better about himself by beating a 51 year old man and finished at my 8:00 pace a few seconds behind him. This was the first 5K that I actually enjoyed. I usually feel dread hitting me because of pushing too hard on the 1st mile and push through anyway. This time I just set my goal and kept it. I finished in 24:17 (about 2.5 minutes slower than my PR). I finished 1st in my age group and 2nd in the 40 and up category. 26th out of 238. TJ finished 2nd in his age group and 9th overall! So, it was a good race. One that I will think back on and smile. I honestly didn’t think I even placed, I just wanted to have fun. I don’t do pictures on my blog. I should. I know people would probably read it more. I just don’t want to spend the time looking for pictures. I want to write and have the content of my writing be what makes people interested. I’m not sure I’ve accomplished that or not, but that is my goal. My daughter showed me her favorite shirt and I took a picture. Yesterday’s post and today’s both have pictures in them. I guess I don’t mind putting pictures in my blog if I see them first and they inspire me. Just not as an afterthought. Not that I mind reading blogs with pictures. I am Jealous of you bloggers that can put the right image in at the right place and it really sets the tone. I just haven’t been able to accomplish that. 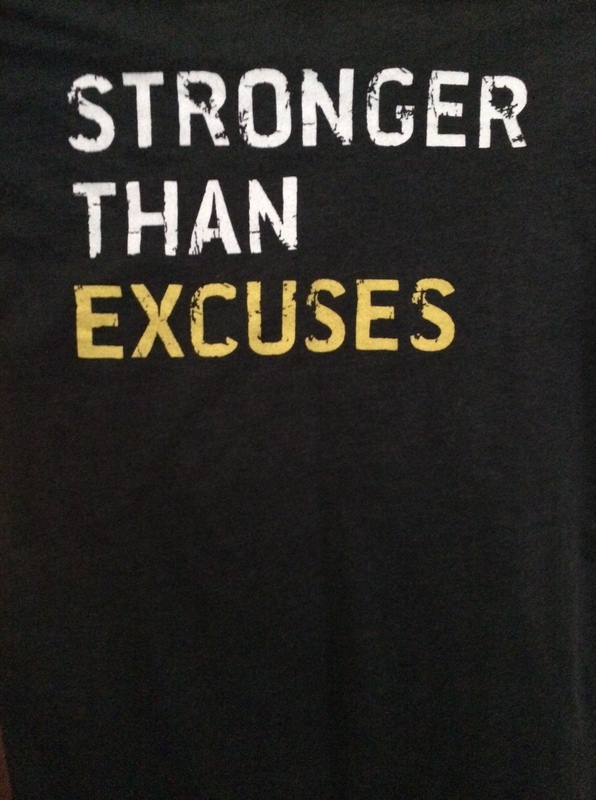 Not that I am making excuses! I don’t know why I just wrote all that. I guess it was just on my mind. Tomorrow is my 5K with TJ. The Red Shoe Run. Used to be called the Red Nose Run. I understand the reason for the change of the name. It benefits the Ronald McDonald House and I guess both red shoe and red nose go with the famous clown. Shoes might go better with running a 5K, but red nose goes well for the winter. Last weekend it was 12 degrees in the morning. Tomorrow it is going to be mid 50’s and raining. Could be worse. Could be 12. So don’t look for any PRs from me. My goal is to run a slow race. Not hurt myself. Enjoy the atmosphere and watch TJ win another medal. Have a great weekend and I hope to catch up with my blog reading at some point… But… No Excuses! Another coooold run yesterday. Not as bad as the day before. I guess it was about 25 with a wind chill of about 17. The heat wave is coming though. Saturday will be a high of 62!!! Maybe the 5K Saturday morning will actually be fun! I got in almost 4 miles yesterday which brings me up to 26 miles for the month at a 10:00 pace. It is somewhat sad to me that I can’t run faster, but I am afraid my hip isn’t quite there yet. Better slow and steady than walking! Have an awesome day and stay warm!